Pike County Dispatch. Your community newspaper in Pike County, PA.
who, what, where and when! MATAMORAS — The Matamoras Borough Council voted to consider joining the intermunicipal agreement with Westfall Township, Milford Township and Milford Borough to fund a joint 537 plan detailing possible public sewer expansion. The Borough Council has not officially joined and will be holding a public hearing at 7 p.m. April 23 to consider the matter. Councilman Dayne Losee was the only member to vote against pursuing joining the joint Act 537 plan. Several members of the audience spoke in favor of the Sewer Expansion Project during the April 9 meeting's public comment period, expressing concerns over the safety of septics failing on small properties and of concerns over DEP mandates forcing Matamoras to comply with costly public sewer construction. A resident said she was concerned about DEP regardless, as they could mandate public sewers at any time and if Matamoras does not complete the 537 plan they may have little or no say in what DEP mandates. Councilman Eric Kudrich recommended anyone interested in the sewer expansion plan should read the minutes of the March Borough Council meeting where the Council questioned a sewer engineer. MILFORD — Although it has been publishing much, much longer, the Pike County Dispatch has been the newspaper of record for the County of Pike for more than 40 years. That means the Dispatch is the place to go to find out about public meetings, estate notices, bids, public hearings, real estate sales and transactions, and Sheriff sales. The Pike County Commissioners listed the Dispatch as an official newspaper for legal notices during their opening meeting of 2014, and once again, during their annual reorganization meetings on the first business day of the New Year, most of the other municipalities in Pike County followed suit. 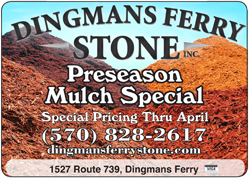 So far, Milford and Matamoras Boroughs, and Westfall, Dingman, Delaware, Shohola, Blooming Grove. Milford and Lehman Townships have made it their business to have the Dispatch as an official newspaper. So make it your business to keep up with all the news in Pike to print, including official business and legal notices from your town. To find out where to buy your copy of the county’s official newspaper or to subscribe for home mail delivery, click here. The Pike County Dispatch is not only Pike County's largest circulation weekly newspaper, it is also the oldest. The Dispatch has covered the historic events that have shaped Pike County for almost as long as that history has been in the making. Over the years, hometown news has shared pages with national and world events, and world events were sometimes right here in Pike County, Pennsylvania. Its pages carry news of joy and sorrow, homespun advice, births, deaths, marriages, spats, feuds, political controversy, scandals, murders, heists, social affairs, dedications--in short, all the news in Pike to print. Look for the Pike County Dispatch at local news dealers, and read all about it! MATAMORAS — Growing businesses and a few new ones opening soon were among the 70 companies represented during the Working Pike Job Fair on Tuesday at the Best Western Hunt's Landing. More than 250 job seekers streamed past the wide variety of employers' tables in the fourth annual event. 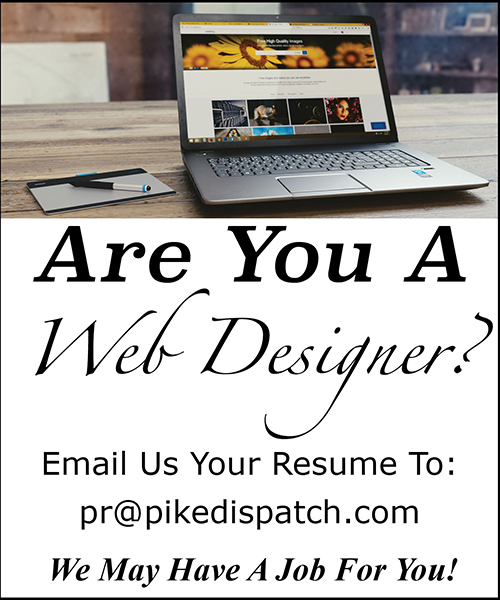 The Pike County Dispatch is a lead sponsor. "Unemployment is at 4 percent. 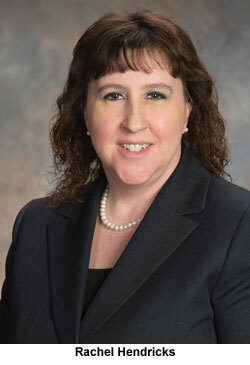 Employers are expanding," said Cynthia DeFebo of the Pike County Workforce Development Agency. Not all visitors were unemployed. Some were looking for better opportunities. "I don't know if it's a huge amount of those (job-seekers), but there are some and others are looking for a second job," DeFebo said. Event organizer Randy Philhower estimated that three-quarters of the tables had return employers from past job fairs and credited the improving economy as a trigger for many companies with growing business and more employment opportunities. She said five businesses had set up tables at the job fair for the first time and said the home care and medical industries continue to be a big employer as well as jobs in tourism, the second largest employer in the area. Representatives of Grimm Construction of Waymart said there is a need for carpenters and other skilled trades workers, pointing out more senior housing contracted work. 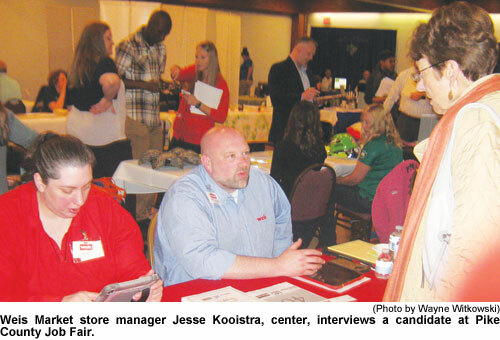 "Again it's another successful year for the Job Fair and it seems to get bigger and bigger as residents look to find better job opportunities and jobs that are closer to home," said Matt Osterberg, chairman of the Pike County commissioners, who swung by.......For more information pick up a copy at a local vendor or subscribe. 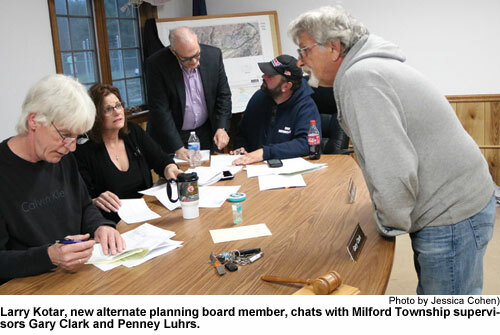 MILFORD — Township supervisors voted to remove Kevin Stroyan and Ray Willis from the planning board on Monday night. They appointed Kevin Nearing and Harry Forbes to replace them, with Larry Kotar as alternate. Township attorney Anthony Magnotta said the decision resulted from Willis and Stroyan's publication of a letter in the Pike County Dispatch about their opinions on a proposed zoning amendment, without consulting other planning board members. "We like to do things in open meetings, not behind closed doors," said Magnotta. "Findings of fact and conclusions of law will be served on attorney Anthony Waldron, who attended hearings on their behalf. They have 30 days to file an appeal with the Pike County Court of Common Pleas if they disagree with our decision, which I'm sure they will." In their published letter, Stroyan and Willis voiced their opposition to a zoning amendment that would allow mixed uses on commercially zoned property. "You can go out and shop and play and go home," said Supervisor Chair Gary Clark of the amendment's intent. "It's nice and trendy, and you have a place to park," he said, referring to a mixed-use proposal on the three-lane near the township building. "But change is hard." He noted the many local changes he had seen, having come from a family that arrived in Dingmans Ferry from Holland in 1738 and lived in the area all his life. "When the park came, people went crazy. People didn't get fair prices for their property," he said, referring to the Delaware Water Gap National Recreation Area. Its creation, initiated as a dam project, displaced 15,000 people via property condemnation. "But now a third of the county is available for hiking – 138,000 acres," he said. "You can't cover it all with commercial property. "......For more information pick up a copy at a local vendor or subscribe. MILFORD — Exciting, unexpected, realistic, impressionistic, abstract – the bunny paintings of celebrated artist Hunt Slonem have something for everyone, and just in time for Easter, they will be on display during a reception and book-signing open to the public at the Hotel Fauchere, on Saturday, April 20 from 3:30 to 5:30 p.m.
Slonem, who recently purchased a home in Scranton, PA, has had his work exhibited all over the world and is included in many private and museum collections. He will be present at the event to discuss his work and sign copies of "Bunnies," published by Glitterati Editions. Glitterati's publisher, Marta Hallett, is a Milford resident and will also be in attendance. "When we published Bunnies, it was the first time Hunt's bunny paintings appeared as a collection," said Hallett, "and they have been enormously popular and make a wonderful gift." Hallett says that every morning Slonem awakes and performs what he calls his "daily warm-ups." Within the course of half-an-hour, the artist paints rabbits on a series of small rectangular panels made of wood and Masonite, each work a post-expressionist narrative gesture of the artist in his element. John Berendt, the author of "Midnight in the Garden of Good and Evil," and a collector of Slonem's work, describes the process as, "…the artistic equivalent of calisthenics in which he flexes his painting apparatus to establish control over the colors, shapes and textures that flow from his mind's eye through his arm, hand and brush on the painted surface." In addition to Hallett and Berendt, the Host Committee for the event includes artists Christopher Makos and Paul Solberg, Milford Borough Councilmember and arts patron Annette Haar, Milford Mayor and Hotel Fauchere owner Sean Strub and others. The reception will be held in the hotel's Conservatory, overlooking the enclosed garden, on Saturday, April 20, from 3:30 to 5:30 pm. Wine and sparkling water will be served and the reception is open to the public. Please RSVP by calling 570-409-1212 or email reservations@hotelfauchere.com. MILFORD — Rachel Hendricks recently announced her candidacy in the May 21 Democratic Primary for Milford Township Supervisor. Hendricks worked for the Pike County Economic Development Authority from 1993 until 2012, supporting small business growth and attracting investment in the area. Subsequently, she served as the Executive Director for the Sussex County Association of REALTORS® for three years. Currently she is a legal assistant for a Newton, NJ law firm. She holds Series 6, 63 and 65 investment licenses as well as both life and health insurance licenses. Hendricks says she wants to change the Township's operational culture toward greater transparency and accountability, which the residents and taxpayers absolutely deserve. As the feasibility study for the proposed sewer expansion project is completed later this year, her familiarity with infrastructure development programs and experience with grant administration for capital projects like the Pike County Public Library and Grey Towers National Historic Landmark's Visitors Center will be a valuable asset to Milford Township. A Milford Township taxpayer for more than 20 years, Hendricks raised her two children here with her husband David. She serves on numerous boards and committees for the Milford United Methodist Church where she is an active member and previously served on the Boards of GAIT Therapeutic Riding Center, Carbon-Monroe-Pike Drug & Alcohol Commission and Boy Scout Troop 77. Rachel Hendricks is running in an unusual contested Democratic race in the Primary Election on May 21st with the endorsement of the Delaware Valley Democratic Club. "I ask for your vote in the Milford Township primary election and thank you for your consideration." © 2017 The Pike County Dispatch, all rights reserved. Reproduction in whole or part of the format or any content without express permission is prohibited.